City of Saints and Thieves has an immediately engaging open. 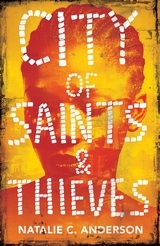 Sixteen year old Tina is a thief in the Kenyan city of Sangui. Together with her street-criminal backers she is embarking on an audacious robbery of the Greyhill mansion in an upmarket part of town. But Tina has more on her mind than just theft. Her mother was killed in that house while working there as a maid and Tina believes that Greyhill senior was responsible. So the theft is also about revenge. But the heist does not go as planned and from there the tale spins out with Tina only barely in some kind of control. Natalie C Anderson, the author of City of Saints and Thieves has a long history of working with refugees in Congo, Rwanda and Kenya and this experience shows. Anderson brings both the Kenyan and Congolese settings vivdly to life. The book is rich in detail about the lives of women and children in Africa’s conflict zones and the role of blood gold in fuelling the violence. As a young girl living on the streets of a fictional Kenyan city, Tina’s skills as a thief are the only thing keeping her from a life of prostitution, and violence is never too far away. While it can easily be read by anyone, City of Saints and Thieves is a book aimed at a young adult audience. The action is driven by teenagers – Tina, her best friend computer hacker Boyboy and Michael Greyhill, the son of her nemesis, keen to prove that his father did not kill her mother. The three teens have plenty of agency in the story, meeting with a dealing effectively with adults in the pursuit of their goals. Good murder mysteries for young adults are hard to find and City of Saints and Thieves is, if nothing else, a great murder mystery. The story is well paced and the reveals, when they come, are both foreshadowed and heart-breaking. But what sets this apart is the context in which the story plays out, the conflict that has riven East Africa and its impact particularly on women and children. Making this an eye-opening and compulsive debut.